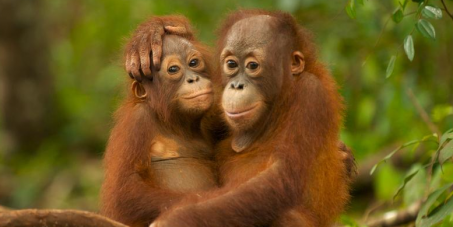 Save Tripa, Save Orangutans – please help! Large areas of the Tripa peat swamp forests in Sumatra – crucial orangutan habitat – have been cleared for oil palm plantations. Once home to 3,000 orangutans, there are now thought to be just 200 left. In 2012, fires swept through Tripa, illegally and deliberately set by palm oil companies. Following a worldwide outcry, the Indonesian government launched an investigation and has revoked the permit of one of the companies responsible for the fires. This was a great result – thank you to everyone who joined the call to save Tripa. But there are five more companies that are still operating in Tripa, clearing protected forests and putting orangutans, other wildlife and the local people at risk! Please sign a petition, calling on Indonesia’s National Police to build on all the progress made so far and put an immediate end to the destruction. They must investigate all the other companies operating in Tripa and stop all the illegal activities. Please share the petition far and wide throughout your networks – we urgently need to keep up the pressure on the government to turn their words into actions. The Governor of Aceh is alleged to have given permission to palm oil company PT Kallista Alam to convert large areas of Tripa to plantations, despite the forests being protected by Indonesian laws and international commitments. The area is part of the protected Leuser Ecosystem and is critical orangutan habitat, hosting among the highest densities of orangutans in the world. Sumatran orangutans are critically endangered, and their precious habitat is being lost at an alarming rate. Without urgent action, they could be the first Great Ape species to become extinct. Visit the following external pages for more information. The Facebook page above has Notes which list products found to be POF (palm oil free), and the BOS site (Borneo Orangutan Survival Australia) has a good list of palm-oil free products. See this link HERE for the BOS list.